In the aftermath of the adventure Big Mike explains how he’s altered history and the team of Conal, Julian, Steve and Birdman come together to revel in their love of the Transformers franchise and discuss the merits of the Big Eyes Small Mouth system before discussing ideals of roleplaying and the ideal ways to start a campaign and what makes one an amazing adventure. With the help of their newfound ally the team of Steve, Julian, Conal and Birdman set a trap to slow (or potentially kill) the enemy Quintessons in their pursuit. However; all is not well. Even after returning victorious to Sentinel Prime the team have more questions. In doing so, they may trigger a series of events leading up to a new war on Cybertron. Will they survive? Will Mike ever tame his own phone’s soundboard? Tune in to find out! Conal, Julian, Steve and Birdman have arrived at their destination. Suspicious of their ease of entry they escape from the city only to find betrayals and danger around every corner. With no other options for survival they must beg for the assistance of one of the most dangerous Transformers in history. But even after that they must still make the perilous journey towards Sentinel Prime. Will anyone on Cybertron offer aid? Birdman, Steve, Conal and Julian have received their orders from Sentinel Prime to infiltrate Iacon and take a power relic from Quintesson control. 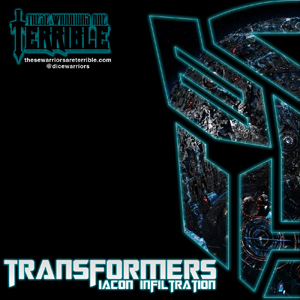 As they infiltrate the capital city of Iacon with their powerful ally in tow they enter the city and sneak into the protected areas they are constantly on guard in case the sharkticons find the heroic team and wipe them out. Will they be able to reach the Omega Key and save Cybertron?